If you love to hike, camp, or travel, I’m sure you’ve a lot of great gear. Well, your dog deserves their own adventure gear too. Below are some of the things I discovered, and fell in love with, for Chester and Gretel in 2016. Adventures with dog often involve some sort of packing, snacks, riding in a car, lounging outdoors, and leashes. These gifts will keep your pup prepared, protected, and fueled while you’re out having fun. 1) K9-Power Carnivore Cookies ™ – Give your dog a taste of the wild. I have plenty of hiking snacks for Chester and Gretel but these are now their go-to lunches (one is plenty big for a small dog). Carnivore Cookies are full of all-natural ingredients like chicken, eggs, tomatoes, and blueberries. They supply dogs with the nutrients they might be missing so that they’re fueled up for the rest of your adventure. Gretel can hardly contain herself around these. 2) P.L.A.Y. Scout & About Chill Pad and Travel Bowl – What first caught my eye about these was the cute pattern (ok, in my opinion, it would be cooler if it were Dachshunds) but, looking closer, it was their functionality that sold me. The Chill Pad is waterproof and UV resistant so it’s great for around the campsite. It also rolls up, has Velcro straps to hold it that way, and attaches to a pack like a bedroll. The filler for the bed is made from 100% post-consumer certified-safe recycled plastic bottles. The bowl is collapsible and made of certified non-toxic and AZO-free dyes. Both are machine washable and come in two colors – mocha and vanilla. 3) Ruffwear Haul Bag – I don’t know about you but my dogs have so much gear that they need their own dedicated bag for our adventures. 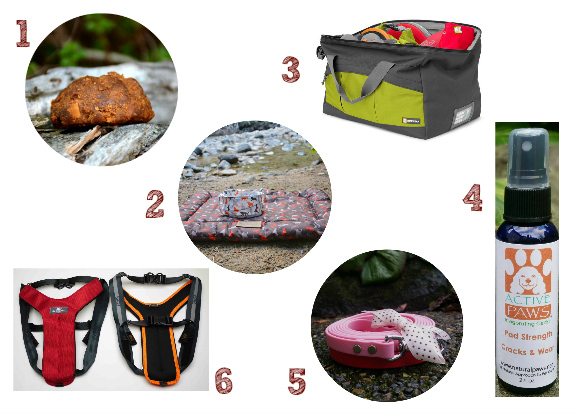 The Haul Bag provides ample space for food, bowls, leashes, dog jackets, toys, and poop bags. It’s made from long-lasting polyester fabric to ensure it will endure many years of being tossed in the back of the car and buried under snowshoes. The most unique feature of this bag is the wide gatemouth opening that springs open and allows you to easily pack, unpack, or access your dog’s gear whenever you need it. 4) Natural Paws ActivePaws – You can now give soothing relief to those heavily worked paws, while replenishing what’s been lost on the trail and protecting for the next adventure. Sweet Pea’s ActivePaws™ was developed for active dogs in need of concentrated strengthening and tissue repair in the paw pad. It contains carefully-selected organic essential oils and extracts and, due to the cedar and neem oils, it can also double as a natural insect repellent. 5) Biothane Leash – Biothane, or coated nylon webbing, leashes are my #1 pick for hiking in dirty or wet places (so, pretty much everywhere here in the Northwest). They are waterproof and easy to clean with a dunk in water or wipe with a wet cloth. 6) Sleepypod Clickit Sport Crash-tested Safety Harness – There are a lot of dog “safety” harnesses out there for riding in the car. Very few are actually crash tested though. The Clickit Sport earned a five star crash test rating from Center for Pet Safety. The harness is stylish, uses a 3 point contact design to keep your dog secure, and doubles as a walking harness. It’s easy to connect to your car (it doesn’t require baby seat LATCH anchors) and allows for exceptional head excursion and lateral movement control. Even adventurous dogs need some down-time. When they are hanging out at home, they probably like to indulge in a little luxury, fuel up with some snacks, and nibble on a few toys. These gifts are sure to make them feel pampered. 7) Bowser Buttercup Dog Bed – The Buttercup Bed has been a favorite around our house for years. I got one and the dogs used to jockey for it. Now we have 4! When the cord is pulled tight, the bed forms a “cup”. It’s the perfect nest for a small dog. It can also be used when flat as a lounging mat. It’s machine washable and comes in small (24″ diameter) for dogs up to 15 lbs or large (32″ diameter) for dogs up to 25lbs. Sorry medium and big dogs, you might want to try one of Bowser’s Donut dog bed (we’ve had the Double Donut before too and loved it). 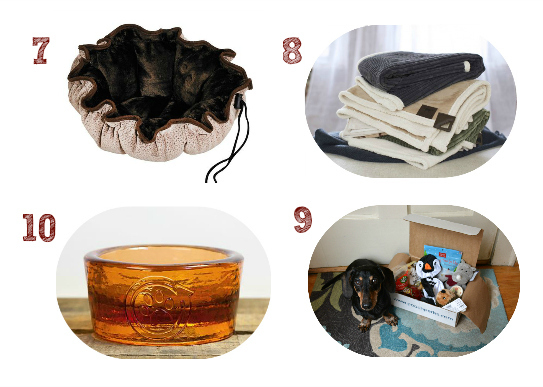 8) Pooch Perks subscription box – This monthly dog subscription box will satisfy their curiosity because each box is a little different. The seasonally flavored treats inside are all natural, made in the USA, and will delight their taste buds. The durable, themed toys are great for a short game of tug, playing fetch, or napping with. You can feel good gifting this box to your dog each month but you can also feel good knowing that a portion of your monthly Pooch Perks subscription is donated to organizations that rescue abused and neglected pooches. 9) Tall Tails ® Fleece Throw or Blanket -These blankets are the epitome of luxury. They are made of thick fleece that stays soft even after multiple washes. They’ll keep your pooch warm and comfy while they are recharging for the next adventure. The corded material on one side is unique to these blankets. They come in two colors and two sizes. Unfortunately, you’ll have to hunt these down at your nearest boutique pet store (or have them order it for you). Otherwise, you can buy their equally luxurious fleece blankets from Amazon. 10) PawNosh Cubby Bowl – This is the most beautiful dog bowl I’ve ever seen. I’ve been raving about them for years. Not only are these bowls made by hand from 100% recycled glass in California, but they are heavy duty and non-toxic. They’re dishwasher-safe and so durable they come with a lifetime guarantee against breakage. You can choose from three colors and three sizes to suit your pet and your home decor. These are all pretty great ideas. I need a new shorter biothane leash. The Ruffwear bag looks pretty awesome, though I do have about a thousand bags already. What I really need for Ptera right now is boots, I don’t have any yet for the tiny dog, and can’t find any good ones that fit her itsy bitsy paws that aren’t meant just as a fashion statement. Why does everything for small dogs assume that you aren’t actually doing anything with them other than dressing them up for fun? Right?? My issue is compounded by the fact that my dogs have ankles the size of Ptera’s and feet the size of a small Cocker Spaniel! Anything that fits over their paddle feet won’t fit around their ankles well. Luckily I’ve found they never need boots. I’ve seen a few that come in small sizes, like Muttlucks, but the ones I’m pretty sure would work for us are not the grippy traction kind. They do make those now but I’ve never seen them in person. A Miniature Schnauzer climbed something like 40 peaks in the White Mountains (many in snow) with their original boots though so they must work fine. Good luck.